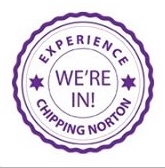 Chippy has been in the news again this week, with stories about the town featuring in both the UK national press and across the water in the US. Unfortunately, both seemed to perpetuate stereotypes of the town that bear little relation to the reality of life here. First, The Times published its list of the 30 best towns to live in Britain, and Chipping Norton was judged to be the fifth best. Before we get too excited, though, the rating was based on a description that few of us will recognise; we are, apparently, “Britain’s answer to Beverly Hills” with honey-coloured houses that are “to die for”. 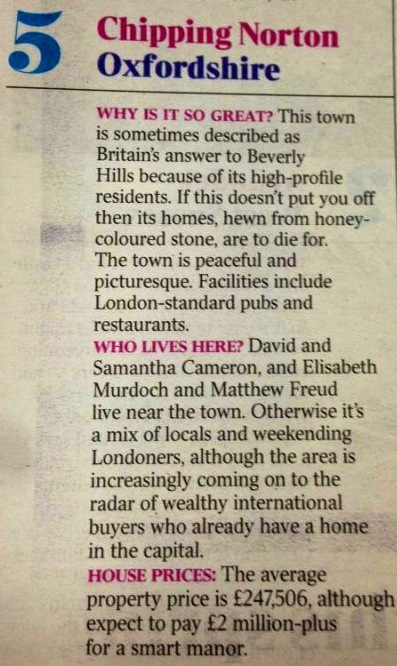 Our residents are a mix of locals, “weekending Londoners” and “wealthy international buyers”. Nothing like a bit of stereotyping. But this is nothing compared to a piece by reporter Amy Chozick in the New York Times. She says Chippy is a a “tiny working-class market town” but then compares it to the wealthy New York State enclave of the Hamptons and says it is “a chummy world — one of shooting and tweed”. Her knowledge of the town is based partly on former spin doctor Alastair Campbell’s comment that the town is full of “farm labourers and miners” – which is news to most in Chippy – and its popularity due to its proximity to Notting Hill. Of course. Are these descriptions that you recognise? We’d like to know what you think of media portrayals of our town. Thanks to Chippy’s own @MTJAM, and the Cotswold Journal’s @freyaleng on Twitter for tipping us off about these stories; the former’s take on The Times piece, on her blog, is well worth a read. This entry was posted in local people, news and tagged Alastair Campbell, Amy Chosick, Cotswold, Cotswold Journal, David Cameron, Freya Leng, miners, More Than Just A Mother, MTJAM, New York Times, politicians, shooting, The Times, tweed. Bookmark the permalink.